I spotted this palette whilst walking through Priceline and I immediately picked it up without even thinking! After the success and countless instagram photos and blog posts that I had seen regarding the original powder contour kit from Australia – I had to see if this was just as good! I picked this up on sale and it was about AUD $12 or so . This palette consists of 3 highlight and 3 contour shades which is exactly the same as the original powder kit. It came in a white box whereas the original came in a black box and this palette has a mirror! The one thing that I did hear/read over and over again regarding the powder version was that bloggers and make-up lovers expressed that the palette absolutely needed a mirror and Australia has brought this to the table with their cream palette. The only thing that the cream palette doesn’t have is the clear plastic protector for the product itself. It instead has a mirror and a clear protector stuck over the mirror. Another thing that this palette has is step by step instructions on the back which covers basic steps to contour/highlight. This is something that I thought was a great idea for people who are new or still learning these make-up techniques! Upon first look inside the palette itself – the yellow shade is seriously YELLOW and the darkest contour shade is very dark. I think that Australis tried to make this a palette that would suit many different skin colours which is a great concept in theory but leaves you with only a couple of colours actually being usable for your skin type (if you want it to look natural). The first thing that I did with this palette was swatch all of the colours on my arm and I will admit, I was quite surprised. I will go over the highlight shades first! The yellow is more yellow than expected and just too yellow for my skin type. The second highlight shade is definitely usable for me and the third is quite pink! It doesn’t look all that pink in the palette but after swatching – it is a little more pink than a salmon coloured concealer (which are GREAT to cover dark circles). The contour shades definitely surprised me. Looking at the palette I thought the first two shades would definitely be wearable/workable for my skin. After swatching them – they appeared to be very orangey/yellow toned and not like that of a contour shade at all. The darkest contour shade is quite dark and looked basically unwearable for me. The textures of all of the creams are a little on the oily side but they are quite blendable and easy to work with. I found the darkest contour shade to be a little more difficult to blend out and found that you have to work quickly with this one. The next thing I did was try these shades out on my face and I did try all of them! Unfortunately, my first thoughts about the yellow highlight shade were correct and this shade just looks ridiculous on me – I have no hope of making this work haha. The second shade is quite nice and I could wear it either under my foundation or on top. The third highlight shade is a little too pink for my skin but I am just going to wear this underneath my foundation and sheer it out to make it work. Now onto the contour shades. Unfortunately the first two contour shades just are not going to work for me. The first one is extremely yellow on my skin and the second one is a mix of orange and yellow. Surprisingly, I found that the darkest shade is okay! You can sheer this out and buff it into your skin to blend it and not make it appear as bold. I do think that I am going to need to work with this a couple of times to figure out the technique and will probably lightly set it with a contour/bronzer powder due to the oily texture of the cream. Have you purchased this product? What did you think of it? If you haven’t, is this something that is on your list? Let me know your thoughts! 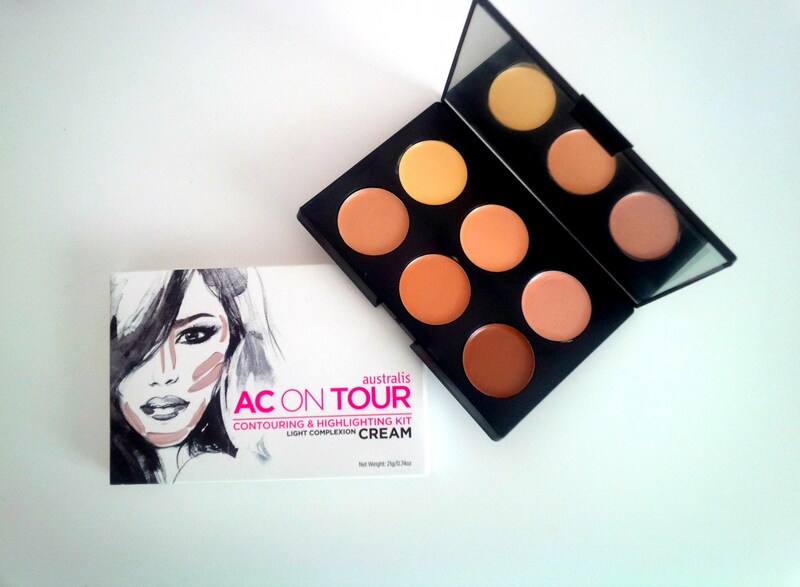 Contouring is such a beauty staple routine nowadays and this product is perfect to define the well sculpted cheek look. That sounds great and good luck for the hunt.